As I reflected on my Thoughts for 2019, three themes stood out. I’ve already written about Convergence and Acceleration, so this post will focus on possibilities. As described recently, I believe the world will experience a Burst of Possibilities enabled by the forces of convergence and acceleration. We should expect these possibilities to multiply in 2019, but realization depends upon multiple factors. One of these factors is a true focus on purpose, posing this question for humanity: how do we harness these possibilities to bring about a better world? 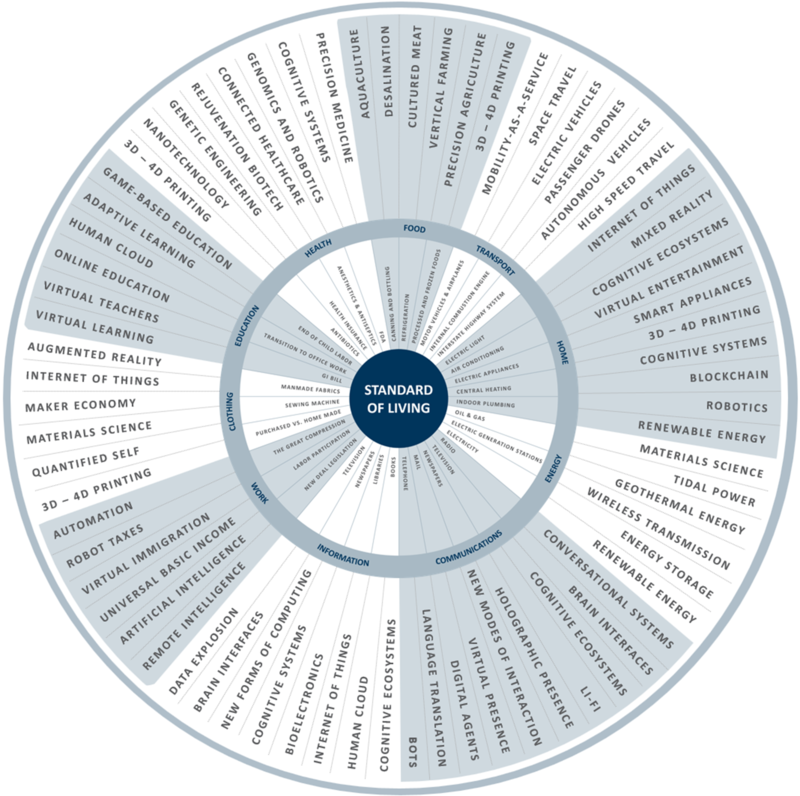 In arguing the case for purpose-orientation and possibilities, I created this visual that maps future advancements to our areas of well-being (click on visuals to enlarge them). I could create a different one that shows how these same advancements can be used to diminish our well-being. That’s why convergence is the most critical theme among the three. An effective way to think about purpose and possibilities is via the United Nations Sustainable Development Goals. These are among the best-known and most frequently cited societal challenges. I believe we are entering a period of astounding innovation – advancements that have the potential to address these goals. When I first launched my Blog in 2010, it was titled Blurring the Boundaries. It was growing ever clearer that the lines between physical and digital, industries, business and IT, you name it, the lines were blurring. It was evident that our growing digital world would drive significant structural change. These new era structures would fundamentally alter our belief in long standing institutions like management, policy, process, procedure, legal frameworks, accounting principles, organization structure, business and operating models, governance, regulations, institutions, and the core characteristics of new era organizations. In essence, The Collapse of Traditional Structures will lead to a Third Tipping Point in Human History. 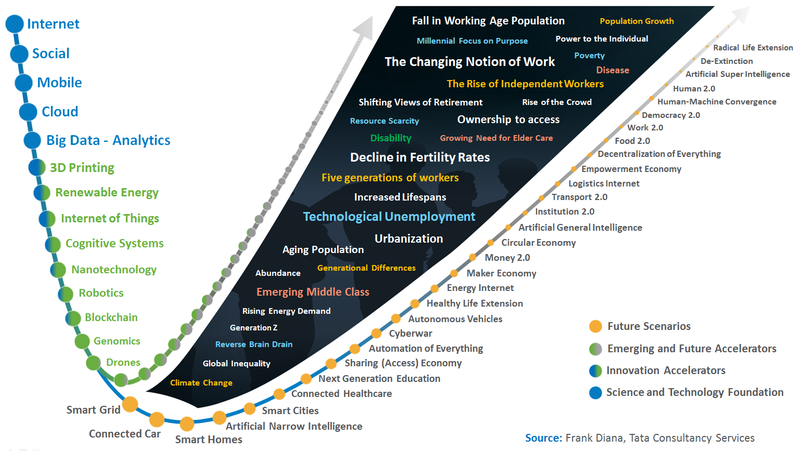 One of the most profound changes will be the dissolving of industry boundaries and the emergence of ecosystems. Our industry construct – born during revolutions that set the standard of living in the western world – will give way to a finite set of horizontal ecosystems. This visual depicts a perspective on an ultimate finite set of nine ecosystems. That’s a scary thought – but accurate. That thought comes from a recent Mckinsey Insights post titled: Think digital is a big deal? You ain’t seen nothing yet. Thanks to Heidi Schwende for sharing this article. Big Data is the latest buzzword attracting all kinds of attention. A Brand New Report by Mckinsey takes a detailed look at this new phenomenon. Mckinsey defines Big Data as datasets whose size is beyond the ability of typical database software tools to capture, store, manage and analyze.